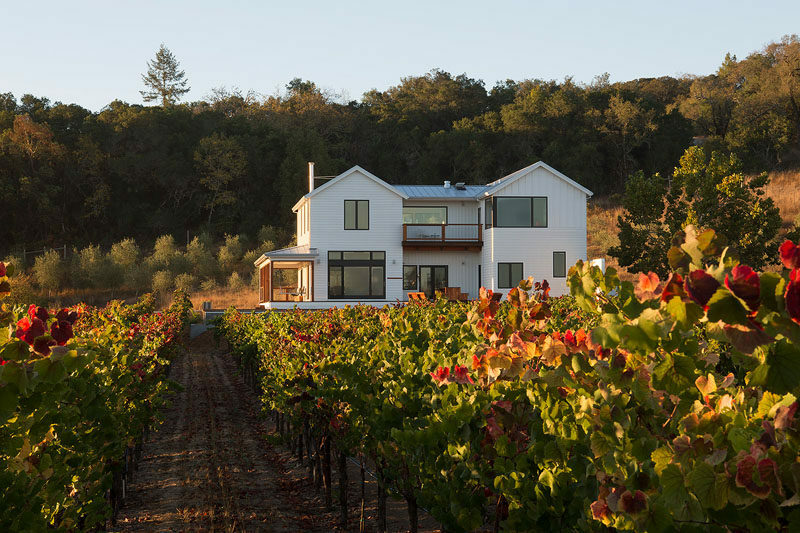 Architect Amy A. Alper, has recently completed a contemporary renovation and second story addition for a farmhouse in Russian River, Sonoma County (California), for a tech executive who traded in the startup lifestyle for grape growing. 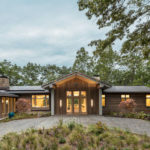 The farmhouse has a wrap-around porch that overlooks the vineyard and leads from the front of the house to the back, where there’s a swimming pool and outdoor entertaining area. Stepping inside into the living room, a picture window frames the view while a high ceiling makes the room feel grand and open. 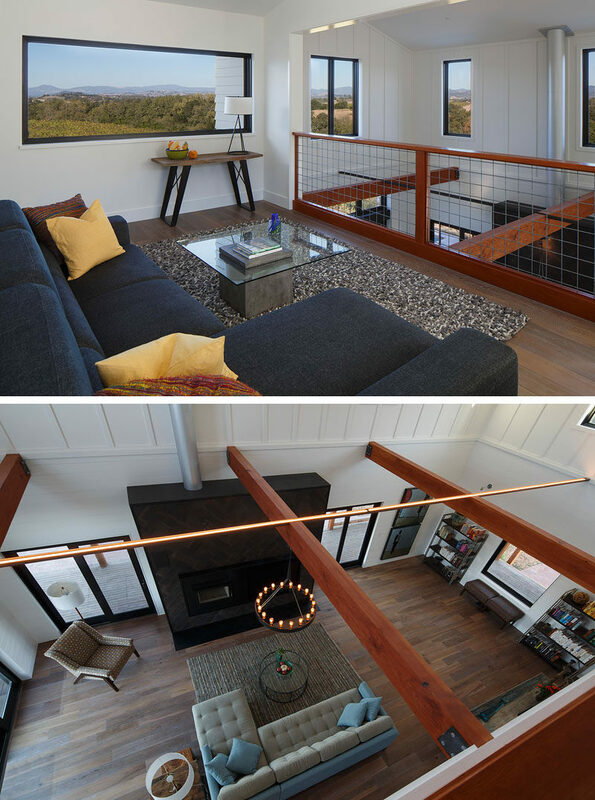 Rough-hewn wood beams add a rustic touch, while black tiles have been used as a fireplace and television surround. Behind the living room is the dining area and kitchen. Tiles laid in a herringbone pattern create a colorful backsplash that stands out against the white cabinets and white floating shelves. A wood and steel island (on wheels) can also be used as a dining table. Dark wood stairs lead to the upper floor of the home. 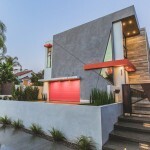 Hidden lighting runs along either side of the stair treads, highlighting the design. At the top of the stairs is a sitting area with views of the mountains in the distance. A balcony provides an alternative view of the living room below. 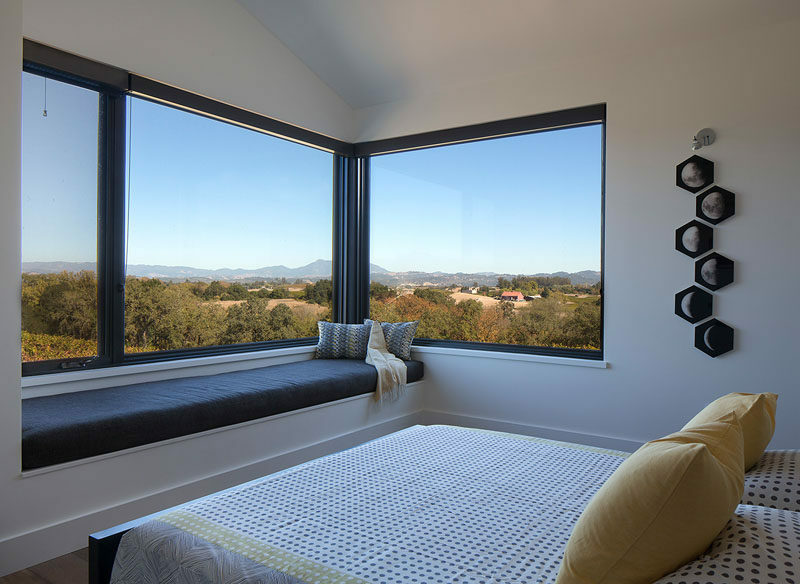 In the bedroom, a built-in window seat provides a place to take in the scenery from the windows. In the bathroom, a high ceiling makes the room feel spacious, while a tiled area is home to the walk-in shower and the freestanding white bathtub. On the opposite wall, a wood vanity is topped with a white counter and a large mirror helps to reflect light.